Facial volume loss causes many of the age-related changes our patients experience including hollowing and sagging of the face. We can restore youthful volume to the face using injectable dermal fillers. Treatment with fillers is quick and easy, often requiring no downtime. They can be used to treat the entire face, from brow to chin.At Capital Facial Plastic Surgery, we offer many top name fillers including Juvéderm® Ultra, Juvéderm® XC, Juvéderm® Volbella, Restylane® Lyft, Restylane® Refyne, and Restylane® Defyne. Dr. Singleton is an experienced injector and performs all filler treatments himself. 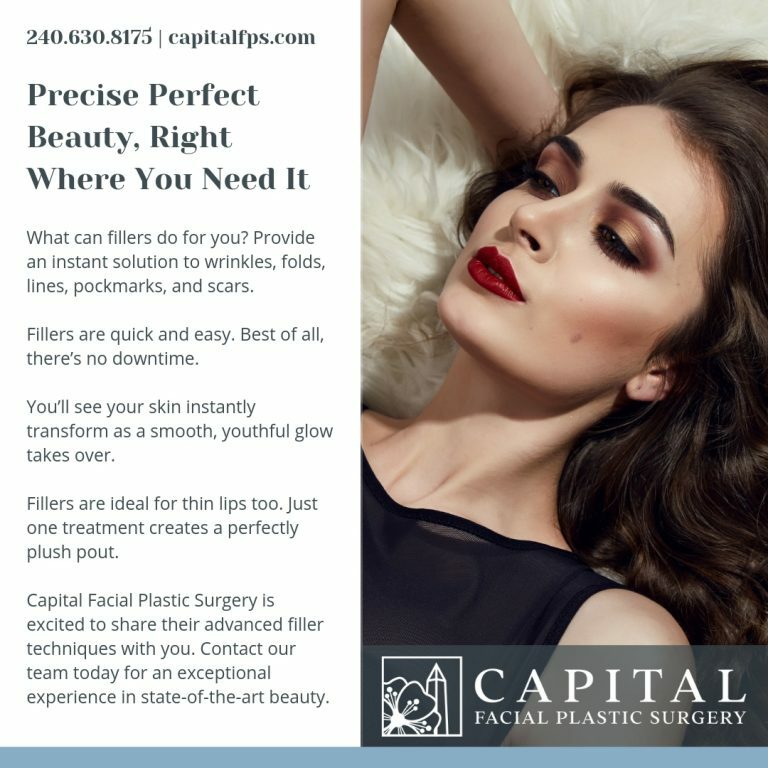 Our patients love the results they can obtain from this non-surgical cosmetic treatment.Our office provides filler treatments to patients throughout the D.C. area. Call us to schedule your treatment with Dr. Singleton. Facial fillers can also be used to enhance the nose in a type of non-surgical rhinoplasty. Dr. Singleton is extremely well trained in the nuances of nasal refinement using soft tissue fillers. Each filler we offer is designed to work in specific facial areas. For example, Juvéderm® XC works best on the cheeks and mid-face, while Volbella can beautifully enhance the lips. Dr. Singleton will recommend a single filler or combination, depending on your treatment needs. At Capital Facial Plastic Surgery, many of our fillers contain hyaluronic acid (HA). This is a substance that is naturally occurring in the body. It helps to keep the skin moist, hydrated, and supple. HA fillers contain hyaluronic acid in a smooth, injectable gel. These facial fillers can be used to fill in wrinkles and smooth hollows by replenishing volume in the treated area. What Happens During a Face Filler Treatment? All filler treatments are performed in our beautiful office, conveniently located in Chevy Chase. Before we administer face fillers, each patient meets briefly with Dr. Singleton. He’ll discuss treatment goals and will choose the ideal fillers for your desired results. Unlike many plastic surgery practices, all our injectable treatments are performed by our fellowship-trained facial plastic surgeon. Dr. Singleton enjoys being involved in every aspect of patient care and performs all post-op checks and filler treatments himself. He is a trained injector and has experience using each product we offer. He will use his deep understanding of facial anatomy to create natural-looking facial enhancement. The actual treatment takes between 10-30 minutes, depending on the number of injections needed. You’ll receive multiple tiny injections in each treatment area. Some patients receive fillers in many areas of the face, while others may only treat a singular area, like the nasolabial folds or the lips. A facial filler treatment will require a series of injections. Most of the fillers we offer contain lidocaine. This minimizes patient discomfort during and after the treatment. Most patients tolerate the injections well and find that the discomfort is manageable, especially since the treatment is over quickly. We can apply a topical numbing cream before if necessary, but most patients do not need it. How Long Until I See Results from My Filler Treatment? Patients see changes in their appearance immediately after a face filler treatment. You’ll see fewer lines and wrinkles, smoother skin, and less sagging. At first, there may also be some post-procedure side effects like redness and swelling. These fade quickly, allowing your beautifully rejuvenated skin to shine. We recommend scheduling dermal filler treatments at least a week before a big event. Since results last for several months, you can plan ahead to ensure that you always look your best. How Long Do Results Last After a Face Filler Treatment? Our D.C. area patients enjoy long-lasting results from their dermal filler treatments. Longevity varies, depending on the filler used, the area treated, and each patient’s reaction to the treatment. Plan on at least 4-6 months of results from a single treatment. Some fillers, like Volbella, can last for more than a year. Learn more about your options for non-surgical facial rejuvenation by contacting our office. Most patients are good candidates for dermal fillers. We’ll discuss your medical history before your treatment to make sure this treatment is a good fit. Can Dermal Fillers Provide a “Liquid Facelift”? Many plastic surgery offices offer a “liquid facelift” treatment, a type of non-surgical facelift that uses dermal fillers and Botox® to smooth wrinkles and rejuvenate the face. We often use fillers and Botox® together, but dislike the term liquid facelift. Dr. Singleton believes that this term misrepresents the results that can be achieved through non-surgical methods. Fillers can provide dramatic rejuvenation, but they don’t replace a surgical facelift. Smooth wrinkles away with injectable fillers in the Washington, D.C. area. Dr. Adam Singleton is a trained injector and is ready to help you look your best. Call to schedule your face filler treatment.